I got a start to my farmer's tan for this summer at Sunday's sketch outing. Clear skies and plenty of sun contributed to great views over the Puget Sound to the Olympic Mountains and the space needle. I broke in my new water color note book with this view from the eastern end of Alki Beach. A volleyball tournament and plenty of beach goers provided a lively foreground with the Olympics and apartment buildings framing the view. I also got off this quick study of the miniature Statue of Liberty. 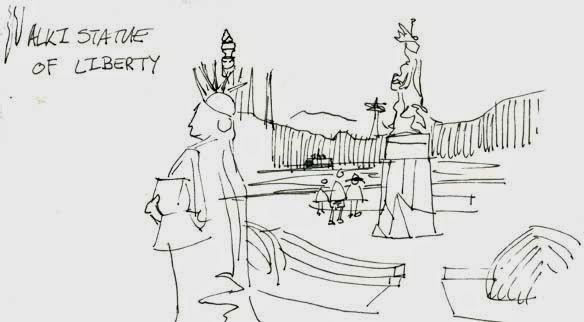 The quick, blind contour line work gives the feel of the statue's robes swaying in the breeze. 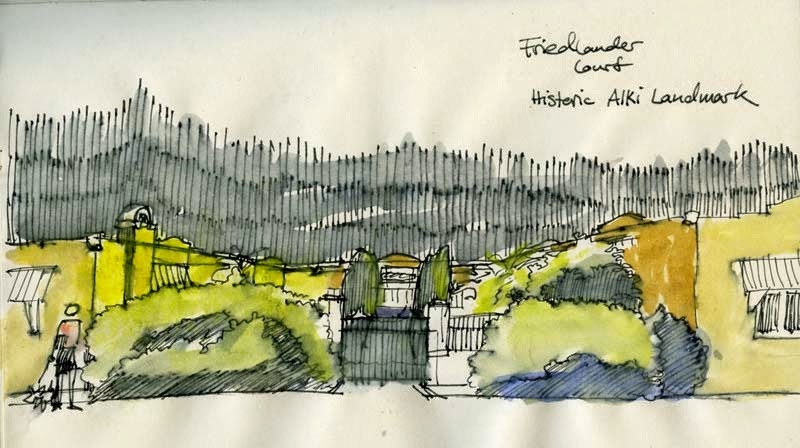 In addition, I did a quick sketch of the historic Friedlander Court Building. However, I was not as satisfied with this sketch because the massive rhododendrons in front of the building masked this Alki landmark. I had hoped to get off more sketches, but I was distracted by the various bungalow style homes tucked away behind the apartment buildings on the beach. Fortunately, I live in West Seattle so Alki is a short bus or car ride away. Really nice variety. I've not see you do watercolor before. They're really nice.